Spring and summer are right around the corner, and parents know that means they need to find ways to occupy their kids. How long will a small child sit and watch a movie or color in a coloring book before he or she gets bored? Bored kids are never fun! Your children may spend hours creating crayon hot rocks. Hot crayon rocks make an excellent decoration for your landscaping. You can border the sidewalk with them, place some sporadically throughout your garden, or border a tree with them. The possibilities are endless. Have your children gather rocks and bring them indoors. Wash and dry the rocks to move any dirt and debris. Place the rocks in your oven preheated to 220°F for approximately 15. Lay newspaper on a flat surface and remove the rocks from the oven and place on top of the newspaper. The newspaper protects your table or whatever surface you are using from accidentally getting hot crayon on it. 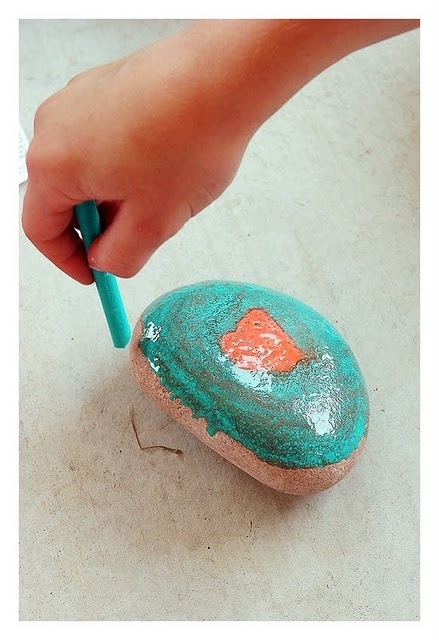 Give your children color crayons and allow them to paint the hot rocks. It is important to remember that creating hot crayon rocks, the rocks are hot and small children should be supervised. Easy. You HAVE to try this!